Digital flood-inundation maps for a 2.75-mile reach of the Saddle River from 0.2 mile upstream from the Interstate 80 bridge in Rochelle Park to 1.5 miles downstream from the U.S. Route 46 bridge in Lodi, New Jersey, were created by the U.S. Geological Survey (USGS) in cooperation with the New Jersey Department of Environmental Protection (NJDEP). The inundation maps, which can be accessed through the USGS Flood Inundation Mapping Science Web site at http://water.usgs.gov/osw/flood_inundation/, depict estimates of the areal extent and depth of flooding corresponding to selected water levels (stages) at the USGS streamgage at Saddle River at Lodi, New Jersey (station 01391500). Current conditions for estimating near real-time areas of inundation using USGS streamgage information may be obtained on the Internet at http://waterdata.usgs.gov/nwis/uv?site_no=01391500. The National Weather Service (NWS) forecasts flood hydrographs at many places that are often collocated with USGS streamgages. NWS-forecasted peak-stage information may be used in conjunction with the maps developed in this study to show predicted areas of flood inundation. In this study, flood profiles were computed for the stream reach by means of a one-dimensional step-backwater model. The model was calibrated using the most current stage-discharge relations at the Saddle River at Lodi, New Jersey streamgage and documented high-water marks from recent floods. The hydraulic model was then used to determine 11 water-surface profiles for flood stages at the Saddle River streamgage at 1-ft intervals referenced to the streamgage datum, North American Vertical Datum of 1988 (NAVD 88), and ranging from bankfull, 0.5 ft below NWS Action Stage, to the extent of the stage-discharge rating, which is approximately 1 ft higher than the highest recorded water level at the streamgage. Action Stage is the stage which when reached by a rising stream the NWS or a partner needs to take some type of mitigation action in preparation for possible significant hydrologic activity. The simulated water-surface profiles were then combined with a geographic information system 3-meter (9.84-ft) digital elevation model (derived from Light Detection and Ranging (LiDAR) data) in order to delineate the area flooded at each water level. The availability of these maps, along with Internet information regarding current stage from USGS streamgages and forecasted stream stages from the NWS, provide emergency management personnel and residents with information that is critical for flood response activities, such as evacuations and road closures, as well as for post-flood recovery efforts. For best performance, right-click and save map sheets to your computer and open with appropriate software. Contains: Geospatial data. Refer to the USGS Flood Inundation Mapping Science web page for more information. Hoppe, H.L. 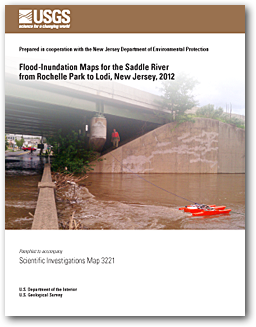 and Watson, K.M., 2012, Flood-inundation maps for the Saddle River from Rochelle Park to Lodi, New Jersey, 2012: U.S. Geological Survey Scientific Investigations Map 3221, 7 p., 11 sheets, scale 1:12,000. Available online at https://pubs.usgs.gov/sim/3221.